New York City’s Cortlandt Street subway station was finally reopened 17 years after it was destroyed in the terrorist attacks on September 11. Located beneath the World Trade Center, the Cortlandt Street station on New York’s No. 1 subway line was once a heavily used station, CBS reports. But as the twin towers fell on September 11, 2001, parts of the towers fell through the terminal. “We basically had dozens of floors of a huge building falling from 600 feet right on top of our roof. It was like a pile driver,” John Ferrelli, then-chief of infrastructure for the subways, told the New York Times in 2001. 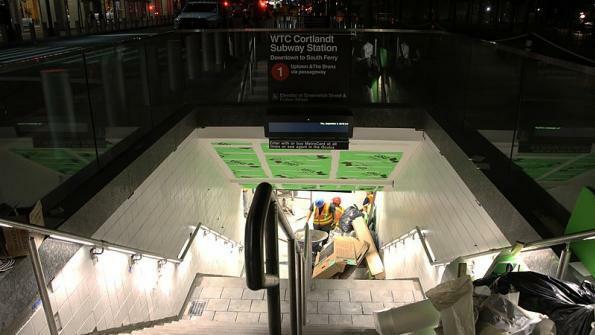 Three days before the 17th anniversary of the attacks, the state-owned Metropolitan Transit Authority unveiled the rebuilt station, now called WTC Cortlandt, according to NPR. It’s one of the final parts of the World Trade Center complex to reopen following the attacks, CBS reports. Rebuilding the site was long delayed, however. It only began in 2015 after the Port Authority of New York and New Jersey handed control of the project to the MTA, according to the Times. The new station cost $181.8 million to build. The new site is easier to navigate, with three elevators and fewer columns than before, the Times reports. It also has electronic signs that provide real-time train information. Additionally, it contains a mosaic of American and Italian marble that contains text from the Declaration of Independence and the 1948 United Nations Universal Declaration of Human Rights, the New York Post reports.